The month of St. Patrick’s Day and pizza is upon us! Before we charge forward into spring, we wanted to take a look back and February and review all the awesome happenings in the Developer community. Check it out! Our next event is the Roblox Pizza party, taking place on March 19th. Be sure to stop in to get your very own pizza launcher! 64-bit Studio for Windows is Live! That’s all for this month’s recap. Here’s to a great March! February. The closure of the second month of 2019 and a considerable month in the developer community, especially concerning the Bloxy Awards. We’ve seen recognition of developer talents, advancement in Roblox technology and the ever-growing library of games on Roblox. Let’s keep moving forward. What can I say? With February comes the Bloxy Awards, a time to hand out trophies to the people who the community recognise as excelling - and leading - in a number of respective categories. The Bloxy Awards have definitely scaled up and I’ve seen new awards in there as well. Congratulations to all the recipients and let’s hope to see some new faces for the 7th Annual Awards Ceremony! More articles are being written in to the Medium page and by now, anyone who hasn’t taken a look at the Medium page should definitely go ahead and do so. There are many resourceful and inspiring developer stories to take a look at and it’s nice to get a perspective from others on development - or relevant topics in general. Nice to see that there’s still an interest in writing on the Medium page. Of course, as per month, a huge congratulations to the individuals who received Developer Spotlights. I find that spotlights are a wonderful initiative to recognise various developers and their works across the Roblox community overall. You also get a quick glimpse at their personal experiences getting into Roblox and developing on Roblox in general, as well as (often) a motivational little note at the bottom. I look forward to seeing who will attain the spotlight this month. Studio Plugin Unloading Changes: I’d just like to be the one to say that I found it to be an absolute pain to have to restart Studio or (un)install proxy plugins just to get my plugin toolbar to refresh or for plugins to clean up their assets from Studio. Plugins are a very valuable development source to use, so of course I’d be ecstatic if they introduced an improvement for plugins that helps for productivity and usage comfortability. Game Archiving: Although it doesn’t hide them from your Inventory (feature request??? ), this is helpful for clearing the clutter in your development page and only seeing the games you want to edit. I have this odd complex with developing on my profile since I have too many assets sprawled across it and I participate mostly in groups, though I will say that archiving has helped me to focus on the projects that matter most to me, right on my home page. Not much to say in terms of Release Notes, though I always snoop around to catch something I might like. Cheers to CloneTrooper1019, as always, for providing API Differences. Player.RespawnTime: I really like this. Sometimes, I can get fairly lazy and don’t really feel like coding my own respawn logic. Being able to delay the time it takes to respawn is helpful to those who are like me or who can’t do that themselves yet (even though there are code examples related to it). I look forward to utilising this to shorten respawn times or add post-death effects. Cache Change of Player Group Methods: Being an avid user of IsInGroup, GetRankInGroup and GetRoleInGroup, this change is fairly promising. My question hasn’t yet been answered in terms of whether this cache means that servers don’t need to restart for them to be updated, but I surely hope so. My current implementation which involves GroupService is far too expensive and I prefer using these straight-forward functions when fetching all groups of a player isn’t necessary. ForceField Material: I haven’t yet experimented with the new Forcefield material, however I feel like when I figure out how it can be used, I’ll be able to make some really interesting works. Perhaps not me, but someone else - people have already begun experimenting with it anyway. Now let’s just get a water material. And so, that is a wrap. Great stuff by the developer community and a huge thanks to staff for pushing new technologies for us to work with. Here’s to March. Really nice recap! 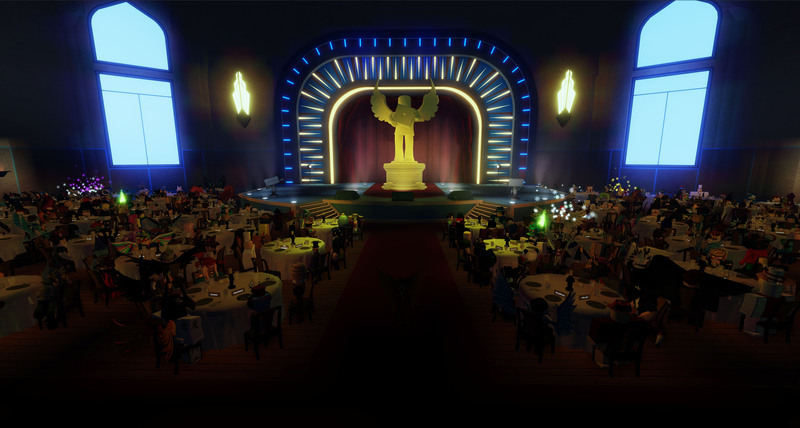 I love seeing the developer spotlights, and of course the bloxy awards! It’s been an awesome year so far, that’s for sure! Think you forgot the group page update (which by the way, still needs fixing in the “Not listing all group games” bug) though. It’s @Sergeant_Roach but great dev forum post new_storm and thanks the hello entertainment devs for making the bloxy event game. I love seeing roblox grow as a platform! Can’t wait for whats to come! The Roblox community has been gaining new ground lately. With the Bloxys coming and going, inspiring stories from developers, and exciting games, I feel like I am proud of this community. Can’t wait to see what the rest of this month cooks up for the players, including the Pizza Party event!